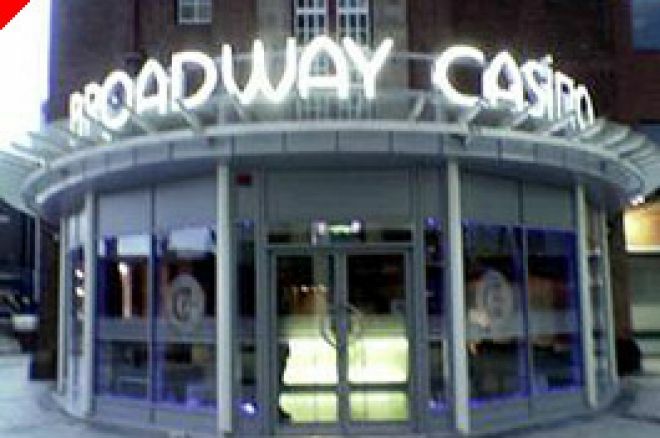 The Broadway Casino took a double chance last weekend, with two freezeouts replacing their usual re-buy events. Both went down a storm, here is a look at Sunday's action. The 9pm start time at Broadway is a little later than most. This however, allows players to enjoy an un-rushed dinner prior to the tournament, if it means sacrifycing a little sleep! The £100 double chance freezeout was sold out. 120 players were seated and over 20 were turned away in what was one of the busiest nights of poker at Broadway since they opened their doors. An army of blonde poker forum players turned up to test their card skills against the finest from the Midlands. In attendance were Simon Nowab, Rob Yong, James Dempsey and international television megastar, Tony "Tikay" Kendall. At the first break the 120 strong field was down to 102. With blinds increasing to 400/800 players were beginning to feel the pinch. Your reporter had average chips at this stage of around 13,000. After the break, players were dropping like flys. Within an hour we were down to 64 players. Even with players dropping away at this high rate of knots it was clear the final table would be in for a long old night. The "big names" had already dropped away by this stage, perhaps fatigue, perhaps the ready supply of alcohol, or perhaps the strong local players were just too good. Whatever the reason, the big guns were gone. By 3.30am the final table had started. By some miracle, your reporter was one of those finalists. Eventually succombing to a nasty bad beat to take 5th place. The whole freezeout weekend, which was organised weeks in advance by Richard Wooten, who has now sadly left Broadway, was a huge success. The regular re-buy events at Broadway must surely now be under threat. With 140+ players wanting seats, Broadway could soon be forced to consider expansion of its superb card room. A Broadway regular scooped 1st place in the £100 freezeout. Whilst Simon 'ACES' Trumper beat Paul 'ActionJack' Jackson in the £30 competition on the Saturday. A heads-up battle described by some as akin to a WSOP final. Ed Note: If you'd rather play poker online then look no further than 32 Red Poker for an instant $10 bonus.